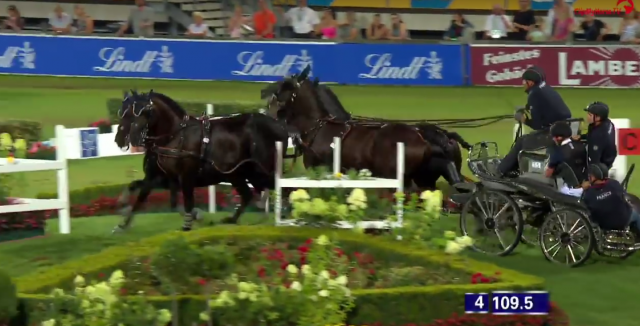 It’s eventing meets show jumping meets combined driving, while means it’s triple the total insanity. It’s Aachen’s annual Jump & Drive! You know what’s more wild than arena eventing, show jumping or combined driving? PUTTING ALL THREE OF THEM TOGETHER. That’s what goes down annually at CHIO Aachen, famous for its world-class equestrian championships… and the infamous Jump & Drive. Teams consist of three equestrians, each representing their “native” discipline of eventing, show jumping or combined driving. The first leg of competition requires the eventer to race over arena obstacles including both stadium fences and solid cross-country obstacles; they pass the baton (so to speak) to the show jumper who rides a shortened course. When the show jumper completes their leg, the eventer sprints madly across the arena to leap aboard a waiting carriage drawn by a four-in-hand and piloted by a combined driver, and the whole shebang careens about an arena pattern with cones. Fastest time wins. The winning team this year consisted of eventing’s darling Michael Jung of Germany aboard Chocolat, show jumping’s Denis Nielsen with Taquadriga, also of Germany, and France’s combined driver Benjamin Aillaud, piloting Favory Fantom, Haico, Maestoso Leo and Topspeed Macho. Why this isn’t a “thing” in the US I’ll never know. Special shout-out to the course designers in Aachen who carved out a multi-disciplinary course complete with two-discipline water complex, plus topography, in an arena. You guys are the real heroes.